If you have a question – Can i check TPM status from command line during OSD ?. The answer is yes. You can find a lot about TPM status by running a simple command. We will jump on to that but let’s see a bit about TPM. It is quite sometime ago, I had shared a post on enabling Bitlocker on Windows 10 without TPM. BitLocker is an encryption feature available in Windows 10 Professional and Enterprise editions. However it requires a Trusted Platform Module (TPM) on the system. Furthermore BitLocker provides the best security when used with TPM. 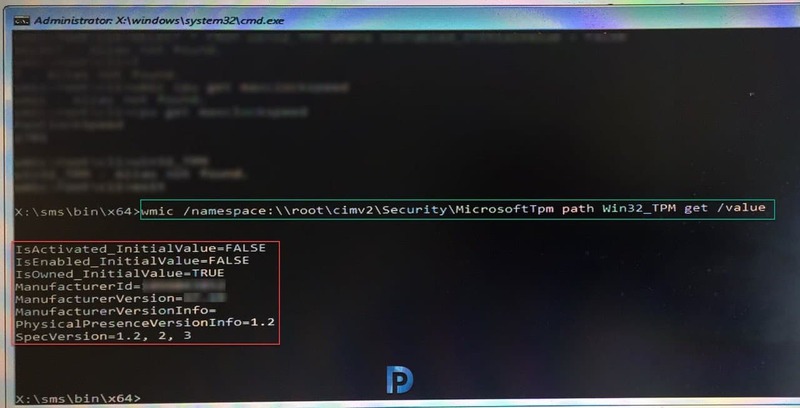 As per Microsoft “A Trusted Platform Module (TPM) is a microchip designed to provide basic security-related functions, primarily involving encryption keys. The TPM comes installed on motherboard of a computer, and it communicates to the system by using a hardware bus”. You can read more about TPM fundamentals here. Coming to the actual topic, some organizations require TPM to be enabled and activated before you image the machine. The TS halts if TPM isn’t enabled (that’s the way the TS is configured). The task sequence checks the TPM status and halts if it is not activated. For example I had covered an issue about Bitlocker Error Configuration change was requested to disable TPM. Press F8 key while you are in WinPE phase. Enter the below command to get the TPM status. To find out if TPM on a computer is Enabled, Activated and Owned, enter the below commands. Here is what you see as output when you enter the above command. From the above screenshot we see several options in the output. We see Manufacturer ID, version. In addition to that, we see the TPM version and SpecVersion. The TPM version is either 1.2 or 2.0. Most of all, the first three lines of output mean a lot.